Mary Jane Lamond and Wendy MacIsaac will be performing in the Clean The Air concert on September 9th in Pictou. It is an incredibly important cause that they believe very strongly in. The best thing you can do is be informed, so please head over to the Clean The Mill website to find out what is happening and how you can help. Click <a href=”http://maryjaneandwendy.com/shows/” target=”_blank”>here</a> for more show details. May is Gaelic Awareness Month in Nova Scotia…a great time to explore your roots! A big congratulations to Mary Jane and Wendy on their East Coast Music Award win for Group Recording of the Year for their album Seinn. East Coast Music Week took place in Charlottetown, PEI from April 2-6 and featured dozens of live performances, an industry conference, and gala awards show. The East Coast Music Association announced the 2014 ECMA award nominees in Charlottetown, PEI this morning and Mary Jane and Wendy are thrilled to have received a nomination for Group Recording of the Year for their album Seinn. The category is stacked with some serious East Coast talent – Acres and Acres, Les Hay Babies, Paper Lions, and The Trews – together, we’d have quite a kitchen party! Thank you to the ECMA and congratulations to all the nominees! We’re looking forward to seeing you in Charlottetown in April. 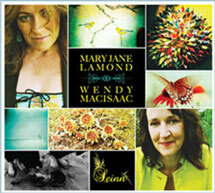 Mary Jane and Wendy won the 2013 Music Nova Scotia award for Traditional/Roots Recording of the Year this weekend in Sydney Cape Breton for Nova Scotia Music Week, and, only hours later as they were celebrating their victory, Seinn was named the Traditional Album of the Year by the Canadian Folk Music Awards. It’s been a busy year for the ladies with shows in the UK, the US, and at home in Canada and things show no signs of slowing down. Thank you to Music Nova Scotia, the members, and the Canadian Folk Music Awards for a memorable weekend!